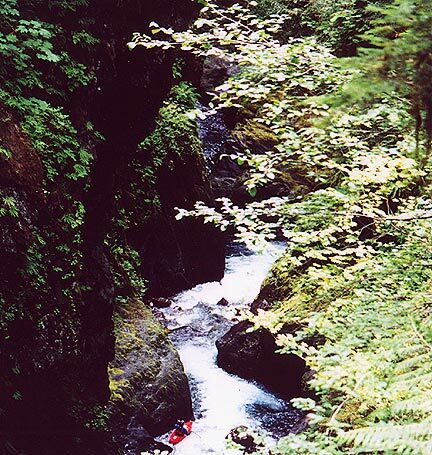 Only four people had ever ventured into the NF Gorge before the weekend of August 19th, 2001: John Whaley, Scott Matthews, Eric Volk, and Sprague Ackley. The river had only been paddled twice, and never as high as it was currently running. When John Whaley called me and told me that he and Jon Loehrke planned on doing the third descent, he didn't have to do much convincing to get me to go along. 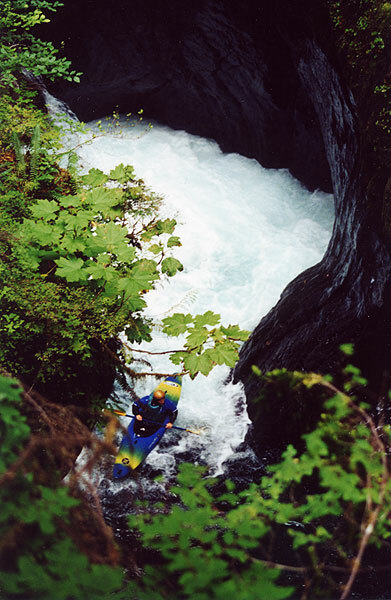 John has a penchant for gorges like the North Fork; he has run the gnarly class V gorge on the Carbon nearly fifty times, and he spent most this last spring soloing the Little White Salmon a couple of times a week to stay in shape. Of course I hadn't paddled class five in as many months, ( I was still recovering from a broken back ) so I knew there was no way I could keep up with these guys on the river. That said, I wasn't about to miss out on this adventure, so I told them I would come along for the hike in and maybe shoot some photos. I hadn't been able to run or exercise much since the accident, so I figured this would be a good chance to see how my back handled a little stroll through the woods. We headed out of Portland Saturday morning and got to the trailhead around 11:30 a.m. John told me that they had carried their boats up to the put-in a couple of weeks earlier, but a sudden rainstorm had brought the river up to an unacceptably high level given the character of the gorge. They had taken one look at the exit rapids at the bottom of the gorge and hiked out, leaving their equipment in the bushes. We were all carrying full packs and we hit the trail at a brisk pace. As we hiked up the river valley the trees got bigger and the we were treated to some spectacular vistas. Magnificent stands of old growth timber towered over us as we moved up into the mountains, giving us a rare but precious taste of what the world was like before the rise of humanity. Great views on the hike up the North Fork. After about nine miles of hiking we reached the Kimta Creek bridge, which was the take out for the gorge. We had only taken about three hours to get there, so we dumped our gear and hiked up the last three miles to find the boats and try to scout the the gorge. For the next couple of hours we vainly scrambled along the walls of the gorge looking for places to scout and shoot photos, but in most places the walls overhung so much that we couldn't see the river at all. We could hear it though, and from the few glimpses I got I was starting to sorely regret not bringing a boat. As the day wore on we caught tantilizing glimpses of cobalt blue water churning it's way through big boulder gardens and several waterfalls. The gorge itself looked like it had been transplanted straight out of jungles of South America, blanketed with moss, lichen and exotic hanging ferns. The river was spectacularly scenic, and it looked like it had the whitewater to match. Nevertheless, I knew that I was in no shape to enter that gorge, and if reinjured myself I knew there was no way out. I was also feeling the hike in, unlike John and Jon, who still had plenty of energy. It was beginning to get dark so we started to hike the three miles back down to Kimta Creek. After 12 miles of hiking (nine with a full pack) and numerous trips up and down the walls of the gorge, I was feeling pretty tired. Of course, as soon as we started back down John took off running down the trail. Now, I ran a lot before my injury and as soon as Whaley took off I wasn't about to just let him get the best of me, so I took off after him, with Jon Loerhke close behind. We blew past a couple of startled hikers, leaping over rocks and side streams as we sprinted into the growing darkness. 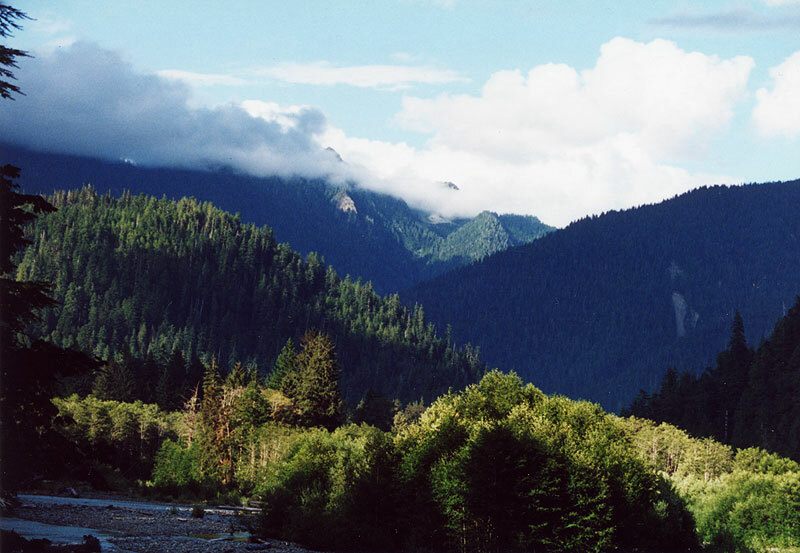 We camped down at the confluence of Kimta Creek and the North Fork. It was a clear night and the roar of the river lulled us to sleep. My legs were already aching and I had another fifteen miles of hiking to do the next day! The campsite at the exit of the gorge, which is also the confluence of Kimta Creek. The last rapids in the gorge are visible just upstream. We woke up early and hiked the three miles back up to the put-in. Just downstream of the put-in we stopped and ate a small breakfast. While Jon and John headed upstream to their boats, I climbed out onto a rock outcropping to shoot photos. Below me the river roared over a series of ledges and smaller drops culminating in a ledge known as 'The Glowing Wall'. Here the river drops over a uniform twelve foot ledge into a circular room which blocks most of the outflow. Most of the water goes left, where it swirls back around and feeds into the hole at the bast of the falls. The only safe line is a precise far right boof with right angle. The walls of the room have been polished and to a bright sheen and reflect the whitewater below, glowing with a ghostly light. Just upstream of The Glowing Wall are a long series of class five rapids (including a waterfall known as Murphy Bed Falls) and at least one portage, so I knew I had a bit of a wait. 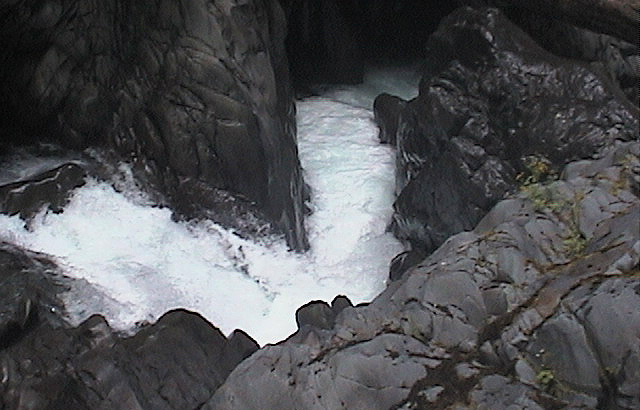 Looking upstream at the rapids leading up to The Glowing Wall, which is not visible in this video extraction. Upstream, Jon and John had their hands full. The river was ripping down into the gorge with a hair raising 275 fpm gradient for the first half mile. They ran most of the stuff and portaged a few times as they approached Murphy Bed Falls. Just above Murphy the river plunged into a violent crack, forcing a careful portage along the rock wall on the right. The portage just above Murphy Bed Falls. Just below the portage was Murphy Bed Falls, a twenty foot double falls that has it's exit drop partially blocked by a slab of bedrock. The first few times this river was paddled there was a slab of bedrock completely blocking the outflow, but the rock had now dropped down into the river, making the falls runnable. After a quick scout, Jon Loehrke quickly made the first run over this falls. Jon below Murphy Bed Falls. After about a half hour I heard a whoop echo up out of the gorge and I peered up through the trees. Above me the creek stairstepped through a long series of drops, and I could see them coming. Soon I heard a thump and saw John Whaley shoot over the falls, landing perfectly in the eddy below. Jon Loerhke followed, and they eddied out in the clear pool below the The Glowing Wall. Jon Loerhke below the Glowing Wall. Shot from inside the gorge with John Whaley's digital camera. We were carrying portable radios in case of an emergency, so soon enough my radio crackled; it was Whaley. "How's it going in there?" I yelled. "Fantastic!" John said. "Loehrke got the first descent of Murphy Bed Falls!!" he sounded excited, and I wished (not for the last time) that I was on the river too. They soon headed off down the river and I kept pace. Every so often I could hear them yelling, and I found a few more spots to shoot photos. Jon Loerhke cruises through the gorge below The Glowing Wall. The Pinch is just downstream from where this photo was taken. Just below the above photo is a rapid known as 'The Pinch'. Here the river narrows to about six feet wide and drops ten feet into a narrow hole backed up by a large emerald pool. The hole is wicked and this drop has never been run. On the second descent John had to do some creative rock climbing to portage this drop. He told me once that the walls are so close together he put his hands on one wall and his feet on the other and traversed downstream, all the while staring down into that hole and hoping he wouldn't slip! This time with more water they decided not to chance it so they threw their boats off of the wall above the pool and jumped in after them. Downstream of the Pinch is Big Falls, a twenty two footer that glances off of a rock about halfway down. At higher flows they estimated this falls would become boofable on the left, but after unsuccessfully attempting to probe the base with a throwbag full of rocks they decided to leave this one un-run. 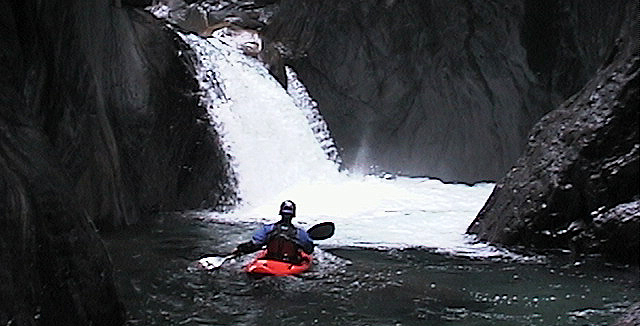 The portage around the Big Falls is difficult. You have to take out on river right at the base of a class III rapid and then wade across the river in waist deep water until you reach the wall on the river left side. From there, you have to rig a rappel line off of a log that is wedged into the wall and then rappel down the wall. On the first descent in 1994 Sprague Ackley and Eric Volk left behind a camming device in a crack in the wall (Eric tried to climb back up and get it, but he couldn't reach it). John removed the cam on this trip, and I'm sure Eric and Sprague will be glad to hear that; they didn't like the idea of leaving something man-made in such a special place. Below the Big Falls are more smaller class III-IV rapids until you reach Whaley's Comet, a tight twelve foot double drop that has a sticky hole at the bottom. John spent about 45 seconds cartwheeling and sidesurfing in this hole before he clawed his way out, and "his eyes were as big as dinner plates when he got out of there!" Jon said later, laughing. The irony of this is that we had seen the bottom of this drop when we had scouted the gorge, and I distinctly remember John yelling: "It looks like the water is going upstream faster than it's going downstream! I don't think I'll be running that one!" We gave him a pretty hard time about that later, let me tell you! 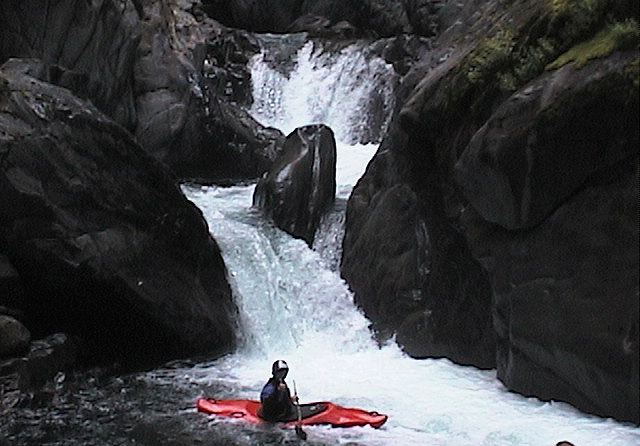 FLOWS: On the weekend of this trip the river was running at 700 cfs on the Quinault Gauge. John said that at flows over a 1000 cfs portaging some of the unrun drops could become quite difficult. John also said that the section from Kimta to Rustler creek would be a fun class III (IV) section if the access were easier and the gorge and the lower section ran at the same time. As it is, at the flows required to negotiate the gorge the lower section is pretty scrapy. He said that below Rustler Creek the river is class II and braided. GETTING THERE: From Portland, take I5 North to highway 12 and then head West to Hwy 101. There are a few annoying little towns that slow you down along the way, but for the most part you can drive pretty fast the whole way. After about 3 to 3.5 hours look for the sign pictured below and turn right. Drive up past Quinault Lake until the road turns to gravel. Continue up about six more miles until the road bends left and crosses a bridge. 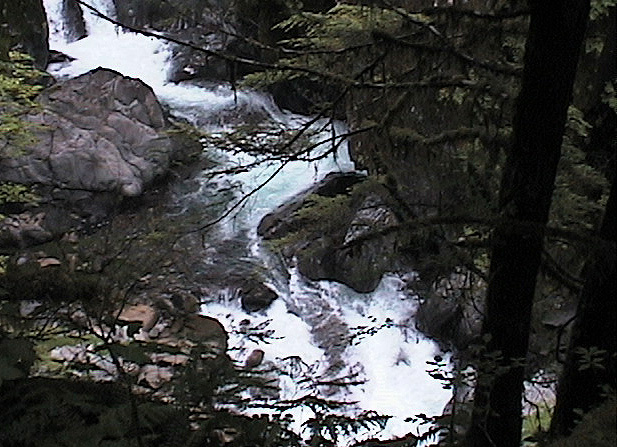 This is the confluence of the NF and SF Quinault in the Summertime. Cross the bridge and turn right, heading up the North Fork. 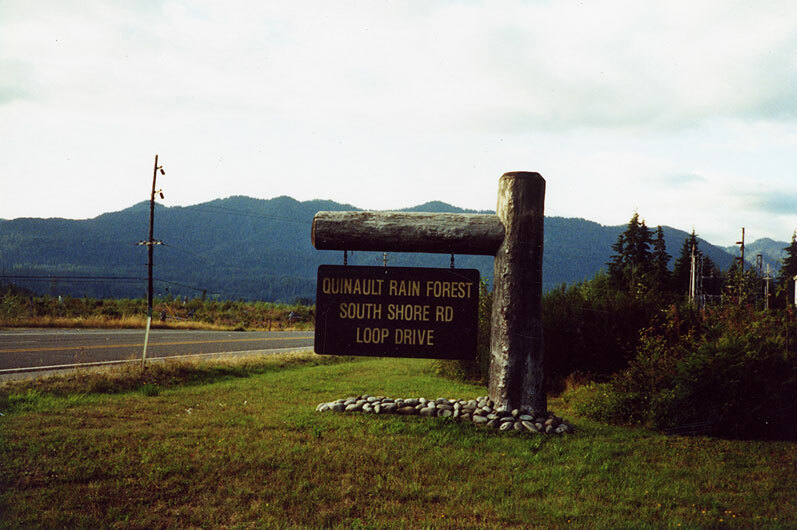 Drive until the road ends at the NF Quinault Trailhead. There is plenty of parking here, and it is so isolated that you don't really have to worry about leaving things in your car, which is a welcome change. All told, it is about a 3.5 hour drive from North Portland to the Trailhead, if you don't stop along the way. There are plenty of landmarks (creeks, mostly) on the hike up, so be sure you bring a good map of the area, or at least scribble down the names of the creeks. All of the major creeks are marked with wooden signs, and Kimta Creek is no exception. You can tell you are getting close to Kimta because the trail begins to cross ever-larger bridges over gorged out creeks. Once you get to Kimta, cross the creek and hike down to river level just on the other side of the bridge. 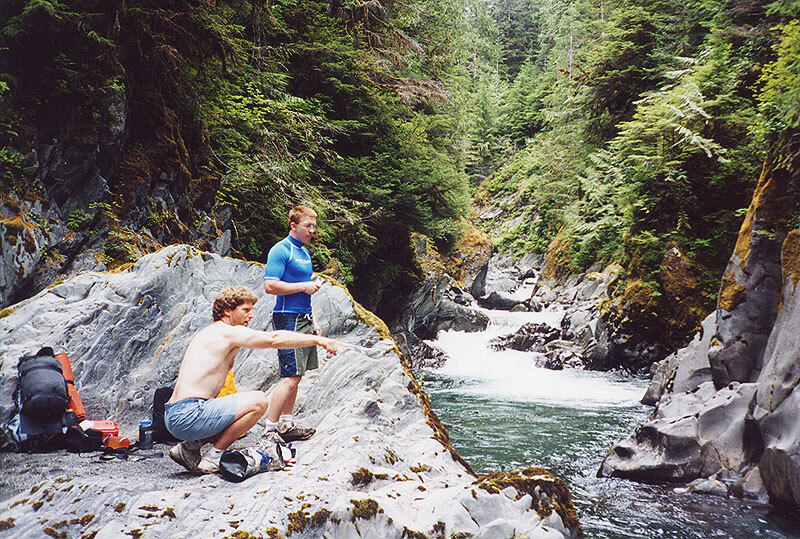 There is a flat rocky ledge where you can camp at the confluence of Kimta and the NF Quinault; this is the spot where John and Jon are pictured at the beginning of this report. Below this spot is nine miles of class II-III to the take out. Above Kimta is the three mile gorge section. When you are hiking up to the put-in from Kimta Creek, there are a couple of landmarks to look out for. About two-thirds of the way up is a huge washed-out creek we call "Blowout Creek" because it looks like the whole mountain came down into the gorge here. 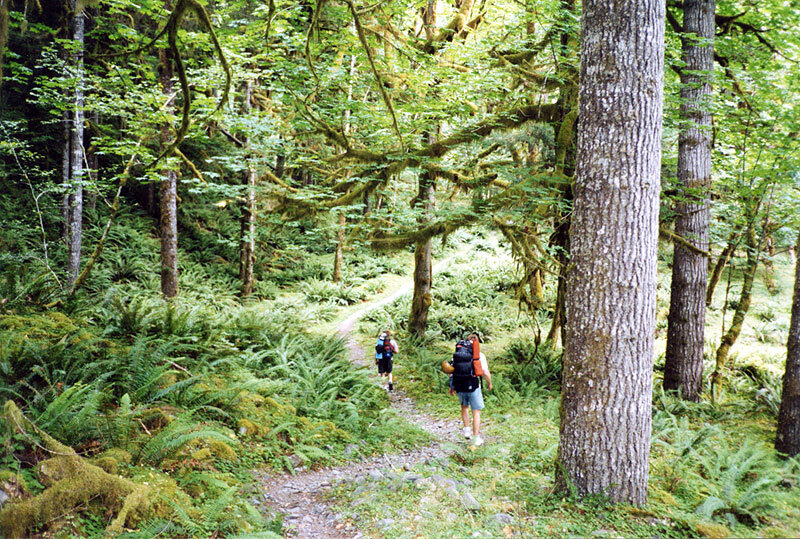 Once the trail goes back into the woods, be on the lookout for a six foot tall boulder about twenty feet off of the right hand side of the trail in the middle of a bunch of ferns (there is only one like it, I will put up a photo of it soon). At this point you are getting close to the Glowing wall. Keep a sharp eye out for a dead old growth tree on the right side of the trail with seven large mushrooms growing out of it (I will post a photo of this soon). Just above this tree is the Glowing Wall. You should be able to hear it and scramble to a point where you can see it. The put in is about a quarter mile above the glowing wall, and is fairly obvious as the trail comes back down to the river and the water is visible through the trees.